Sometimes a perfect storm comes together to signal a radical shift or rebirth of an industry. 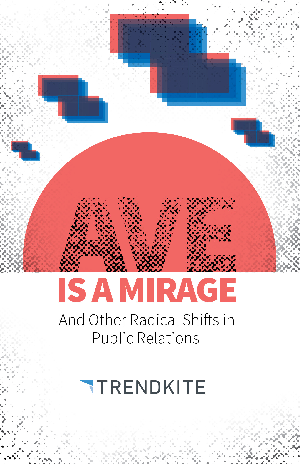 But it’s not enough to say public relations is in flux or rapidly changing. It’s more impactful to discuss the evolution of the change, understand the potential gaps, and be early to capitalize on opportunities created by these gaps. The path for change in the PR industry has been tumultuous. And understandably so. The irrationality of basing performance on vanity metrics is so ingrained in the profession that the left-brain, rational piece has been pushed aside. This has created a culture of estimating based on vanity metrics like AVE (ad value equivalency), leading to a dynamic where the C-suite craves that WSJ or TechCrunch story, yet doesn’t believe PR’s reporting on the value of that coverage. When everyone in the marketing stack is crunching numbers and showing real, tangible value, PR is holding onto air. Why keep setting the profession up for failure by perpetuating the cycle of abstract value?